Former NBA forward Lamar Odom was found unconscious at a Nevada brothel on Tuesday and rushed to the hospital, according to several reports. The news was first reported by TMZ and partially confirmed soon after by Claudia Koerner and Adolfo Flores of BuzzFeed. Both reports say that Odom was found passed out in a room at the legal Love Ranch in Pahrump before being taken to a local hospital and then moved to another Nevada hospital. Let's quote from the BuzzFeed report, which features fewer details but confirms news also found in the TMZ report. Dennis Hof, owner of the Love Ranch South, said two women at the brothel found Odom passed out Tuesday. It appeared that Odom had taken too much “herbal Viagra,” he said. Hof said Odom came in Saturday and was “having a great time partying,” but not drinking a lot of Cognac. On Tuesday two women at the Love Ranch South in Pahrump, Nevada, found him passed out in his room. He was taken to a hospital and then airlifted to another hospital in Las Vegas, Hof said. The more sensational TMZ report says that Odom is "fighting for his life" and is now alone in the hospital after visiting the brothel without friends or family. Mark Medina of the Los Angeles Daily News reports that Odom's past employers with the Los Angeles Lakers are aware of the situation and attempting to find and contact the hospital housing the two-time NBA champion. Update: The Nye County Sheriff's Department corrected initial reports that Odom was airlifted on Facebook. The 6-10 Odom was too tall for a helicopter and had to be taken to Las Vegas's Sunrise Hospital by ambulance. This news follows several years of trouble for the 35-year-old Odom, who checked into a rehab facility for drug and alcohol abuse in September 2013 after a DUI arrest and has seen a once very successful basketball career fall into a series of brief employment opportunities. Wife Khloe Kardashian filed for divorce from Odom in December 2013. The Odom became the No. 4 pick in the 1999 NBA Draft and played 14 seasons for five teams, finding his great success as a unique do-everything forward for the Lakers from 2004 to 2011, when he won the league's Sixth Man of the Year award. He requested a trade and was dealt to the Dallas Mavericks after the dissolution of the franchise's controversially vetoed move for All-Star point guard Chris Paul, which would have sent Odom to the Houston Rockets. 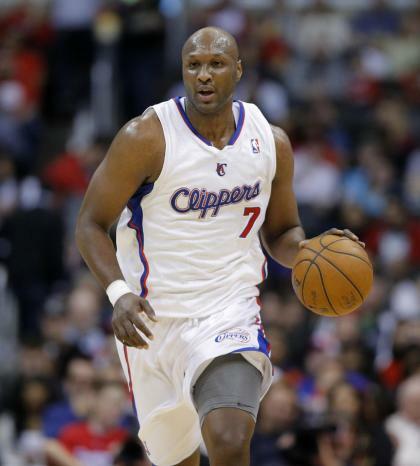 Odom last played for the Los Angeles Clippers in 2012-13 and spent time in New York Knicks training camp last fall.